Visiting the “Home*” to see the living arrangements first hand and to assess it for safety, the individual’s physical abilities and to conduct a psycho-social evaluation, consult with family and/or staff at the facility. Nursing staff is available for initial assessments, follow ups, supervision of the Certified Home Health Aides and on call as needed. *”Home” is the Hospital, Nursing Home, Rehabilitation Facility, Assisted Living Facility, or other living situation where the client currently resides. As people age they often have trouble managing life on their own and just as much difficulty admitting this to be true. Let us help with the conversation. Perhaps all that is needed is someone to cook the meals, clean the house, or monitor medications. Perhaps it is time to discuss alternate living arrangements. An in-home assessment will provide you with an unbiased evaluation from a professional geriatric social worker and a family physician. Both have years of experience in addressing the very situations that you are now facing. 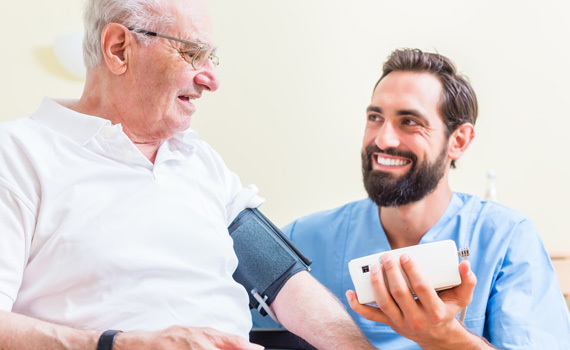 By coming into the home we are able to see first-hand how accessible the living environment is for your loved one and make recommendations accordingly. We’ll provide a full psycho-social evaluation and assess your physical abilities. Through comfortable yet thorough conversation we are able to evaluate personal capabilities on a cognitive and physical level and determine appropriate approaches to care. An evaluation of basic skills including bathing, dressing, cooking, and cleaning will be done to assess your loved one’s ability to live independently. Once this in-home assessment is complete we’ll discuss what we have learned with you and advise you about how best to handle the challenges that your loved one may be facing. It is common for us to provide crisis intervention and family mediation during stressful situations. We are often called upon to serve as a patient advocate, asking doctors tough questions and fighting for the best care for those we serve. We advocate for those who need our help, whether living at home, in a hospital, a sub-acute rehabilitation facility, an assisted living facility or skilled care facility.